AN FUN AND ENGAGING WAY TO WAKE PEOPLE UP AND SAVE CIVILIZATION! 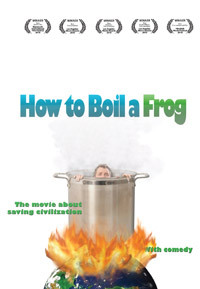 How to Boil a Frog is a highly entertaining eco-comedy (documentary film) that mixes rapid-fire humor with hard-hitting facts to show the consequences of too many people using up too little planet, much too fast -- and provides five surprising ways that regular people can help save civilization while making our lives better now. The film features everyman dad narrator, Jon Cooksey (a screenwriter in real life), who is a guy worried about his daughter's future. Cooksey plays a dozen different characters in the film to illustrate his points, from a lab-coated scientist to a surfer dude. He recounts his own wake-up moment on climate change, and his subsequent discovery that global warming is part of a bigger problem -- "global overshoot" - humans putting too much demand on our limited natural world. After presenting the consequences of overshoot, Jon launches into a clever review of five major problems we face, and how they're connected: overpopulation, the war on nature, income inequality, peak oil and finally global warming. From there, he offers a set of positive solutions that can be accomplished by individuals and families to help turn things around. Along with the comedy, the movie interweaves animation and experts in relevant fields to help encourage both awareness and action. A useful & unique companion study guide done in the same style as the film can be found on the Download Resources page. "Jon Cooksey's How to Boil a Frog brings humor to a deadly serious subject: Earth's future. With a refreshingly flip style that pulls no punches, Cooksey employs animation, jump cuts, talking heads, and a lot of role playing to address five major areas of concern. Tthis funny and sobering environmental documentary is highly recommended." "Ambitious and insightfully practical...I give this one high marks. (Cooksey) has tapped in to an important way to communicate tough issues to an increasingly distracted audience: make 'em laugh. He presents it all with an edgier take on the whole Bill Nye the Science Guy vibe. Hey, it works for Jon Stewart." "Featuring humor, fast-paced editing, animation, and lots of facts presented by experts, Jon Cooksey tells about his awakening to the crisis of global warming. He advocates that the time is now to act and we are all leaders in creating solutions." "Recommended. A unique blend of comedy and facts, as well as the incorporation of personal and expert interviews, to make complex environmental issues easier to understand and more accessible. The cinematography and sound quality of this film are excellent. This documentary with its entertaining yet serious message regarding the future of our world would make a great addition to any library, public or academic, or classroom collection." "A feisty little film which is down-home in style, and humorous."